Snipe Barn is a rural and contemporary barn conversion that accommodates 12+ people arranged over one level. This large holiday home has been finished to an excellent standard and includes all mod cons that you could need for a perfect stay close to Burford and Oxford. The open-plan design, high-beamed ceilings and large glass frontage create a warm and welcoming atmosphere for entertaining and enjoying the tranquillity of the beautiful surroundings. Offering flexible sleeping arrangements, the barn is ideal for large family groups and friends. Situated on a nature reserve, you feel a million miles away from it all, whilst remaining close to the local villages of Aston and Bampton. It is dog friendly too and there are some fantastic walks from the doorstep along the Thames Pathway. The spacious kitchen/dining room is the barn's party piece! The kitchen is well equipped with everything you would need for easy catering and the dining table can comfortably accommodate 12+. It leads through to the large sitting room with TV & DVD player, plus a wonderful wood burner for those chilly evenings. The floor to ceiling glass looks out over the courtyard, filling the space with light. There is a useful utility room with washing machine/tumble dryer & sink, plus separate loo. Bedroom 6 - king size zip/link bed (plus extra single bed on request), large plasma TV and en-suite wet room. This bedroom can also be converted into a meeting room on request. The bedrooms are really flexible, so please let us know your requirements and we will do our best to accommodate your group! Enclosed courtyard including lawn and terrace with large outdoor table, parasol and Weber charcoal BBQ. Private parking within the courtyard or just outside for 5-6 cars. There is a small paddock to the rear of the barn, accessed from the kitchen, and great for outdoor activities! We had a fantastic stay at Snipe Barn and Rose Barn in April, 23 of us for a hen weekend. We found the property had everything we needed and was a lovely luxury stay for us. We were spread across the two barns to sleep and used Snipe Barn as our main area for dining etc. Great stay and would highly recommend for large groups. Everything to do with the booking was very well organised and lots of help with arranging which rooms were best suited to which people and helping us accommodate everyone together for meals etc. Thank you. Snipe Barn hosted myself and 13 guests for a relaxed Hen Weekend. 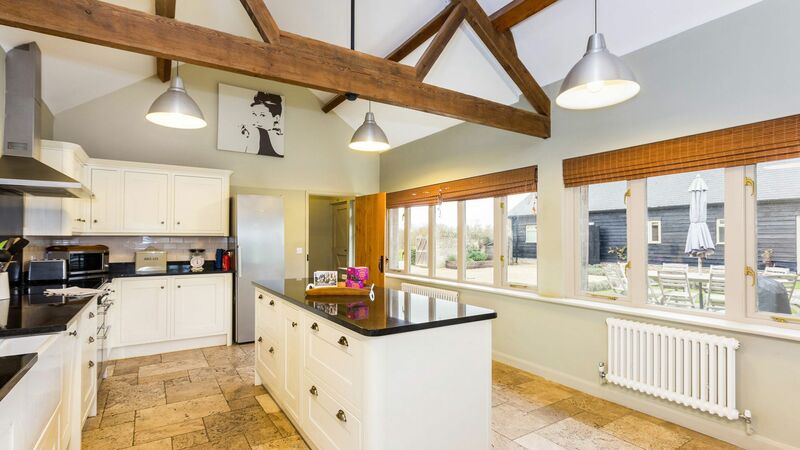 The Barn is enormous, with a beautiful living space and open plan kitchen-dining area for a large group to enjoy meals. The location is stunning, my only regret is that we didn't have more time to explore. Definitely will be coming back in the summer to make use of the BBQ facilities! ''Beautiful cottage, we had a wonderful stay. We absolutely love this place! It was perfect for our 3 generations. Lovely setting for a celebratory 65th Birthday. Quiet walks from the doorstep, delicious meals at 'The Plough' at Kelmscott. This property is highly recommended!! Darron the property manager was helpful with all of our queries - nothing was too much trouble to him. 10/10 - Thank you StayCotswold! Fantastic house - would hugely recommend to any future guests! The house itself is really spacious and very comfortable for large groups (we were 10 adults + 4 children). We never felt on top of each other or crammed in at all. Also great that so many bedrooms are en-suite, meaning there were never any queues for the shower over the weekend! We felt very welcome and well looked after - from the communications during booking, to the really thoughtful welcome pack on arrival. The area is beautiful - with the house tucked away enough that you can enjoy the peace and quiet, but close enough to pubs and nearby towns for when you'd rather get out and explore. We'll definitely be coming back! Thanks so much. Gorgeous house in a lovely, rural location. Millie and Fergus were great hosts and made everything easy from the start. The house was sparkling clean and really really cosy. The pictures don’t do it justice! It was much warmer than we expected it to be and the log fire made it extra cosy. 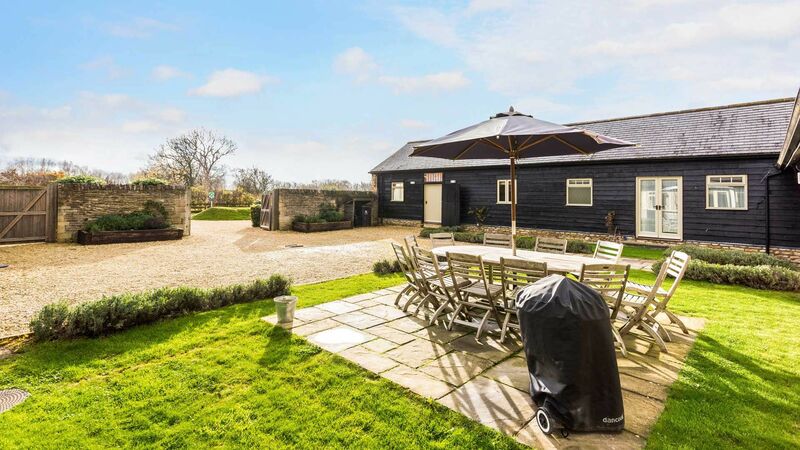 Perfect property for a large party/chilled weekend away/hen do. Lovely festive touches too with the Christmas tree! I would recommend to any large groups looking for a relaxing weekend in the countryside. Snipe Barn was the perfect place for a family get together. It offered the luxurious space we wanted for a group consisting of 10 adults and two young children. There was plenty of space to sit around the table and in the lounge together. It is in a lovely quite spot about 8 miles from Witney where we started our weekend meeting at The Fleece for lunch. Once we arrived at Snipe Barn we had a guided tour by one of the team there. What was particularly nice was the extra touches they provided, milk, a lovely loaf of bread, coffee and chocolates. It just made you feel special. Friday night we had a walk around part of the nature reserve and then on Saturday we went to Blenheim Palace. It was lovely to get back and light the fire in the log burner it made it all seem cosy. We would definitely come back to this location, it really did have everything we wanted and more. Ideal for a family break with young children. No stairs, gates to provide security and a good field. We enjoyed our break, it’s our second visit. If there’s any complaints they would be that it gets very warm, probably due to single storey construction. A lovely peaceful location right on the nature reserve. This was a perfect barn for a big family get together. It had everything we needed and more! Massive rooms, thick doors to minimise noise, good outdoor areas, comfy beds and washing up liquid and hand soap included. Staycotswold did a great job managing our booking and were quick to reply to any questions. Highly recommended. Just got back from a Fitness Weekend at Snipe Barn. The Barn is amazing - bedrooms very spacious, beds comfortable, kitchen and lounge areas spacious with everything you need and very clean. Outside space great. We would love to go back next year. The Barn is amazing - bedrooms very spacious, beds comfortable..
A fantastic place to stay in beautiful surroundings. We loved the visiting rabbits and deer. Just wanted to say we had a brilliant weekend. The barn was everything the pictures showed and more. The weather was glorious and we sat outside for breakfast and it felt we were on holiday abroad. Darren was there to greet us and was extremely helpful. An excellent weekend. Pass on my thanks to all concerned. Fabulous accommodation for a large party... so much space... everything you need is there . Spotlessly clean. Lots of car parking area. Lovely walk to the locks... would recommend it to anyone! Please note that a 30% reservation payment plus a £60 booking fee will be required on confirmation of booking. The final balance will be due 8 weeks before arrival. Prices stated are based on an occupancy of up to 12 guests. An additional supplement of £75 per person will be applied, up to the maximum occupancy of 15. Please contact us for further details regarding additional occupancy as it is subject to sleeping configurations and permission. A damages deposit of £500 is required to cover any breakages or extraordinary cleaning. In most cases, this will be taken as an authorisation on a credit card. Early arrivals and late check outs to be agreed on request, please note additional charges will apply. Cots and highchair are available on request. Located in the Chimney Meadows Nature Reserve, in which guests can enjoy beautiful walks from the doorstep. It is the perfect place to relax with family and friends and is just 30 mins from the iconic city of Oxford, 45 mins from the Regency town of Cheltenham, and 90 minutes from London. Why not explore the nearby Aston Pottery and Coffee Shop, or the village of Bampton, made famous by Downton Abbey!